A low-maintenance perennial that's sure to be a star in your garden! 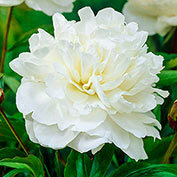 Shirley Temple Peony's large, white double flowers are blushed and dappled with soft pink hues. Fragrant flowers attract pollinators. Treasured as cut flowers, these garden classics bloom in late spring. 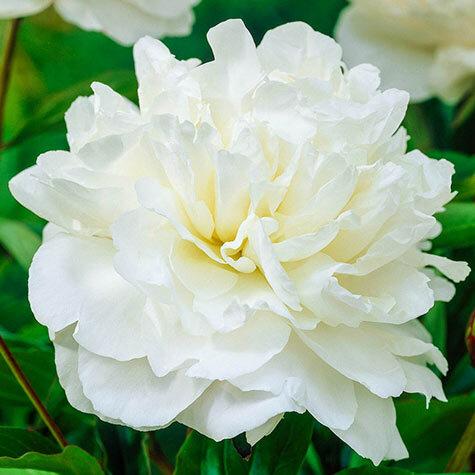 Peonies are long-lived perennials that have few pest and disease problems—and they're deer resistant. Plant several in a row to create a low-growing, low-maintenance hedge that never needs pruning. Or plant as a specimen plant in the sunny mixed perennial bed. Grows 30-32 in. tall with a similar spread. Plant in full sun to partial shade. No. 1 root divisions with 2-3 eyes. Zones 3-8. 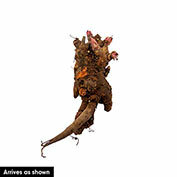 Depth: Dig a hole large enough to spread the roots without bending them. Set the crown with buds 1 inch below the soil level. Water thoroughly. Flower Form: Large, 8-inch, fully-double blooms. Flowers open as a light pink color and mature to white. Pruning: After flowering, remove spent flowers stems to maintain attractive foliage during summer. Comments: Shirley Temple features very large, 8-inch, fully double blooms that emerge a light rosey pink and mature to white. Outstanding as a cut flower. Dark green foliage remains attractive through summer.